General Creighton Williams Abrams, Jr.
Creighton W. Abrams, Jr. was born in Springfield, Massachusetts, on 15 September 1914. He graduated from the United States Military Academy in 1936, was commissioned a second lieutenant, and assigned in the 1st Cavalry Division. In 1936, he married Julia Harvey. In 1939, Abrams was made a first lieutenant, and a year later, a temporary captain. During the Second World War, he was a battalion commander in the 37th Armored Regiment. He received temporary promotions to major and lieutenant colonel. Later in the war, he fought with the 37th Tank Battalion and Combat Command B, 4th Armored Division. Abrams also served with the Army General Staff in 1945 and was promoted to temporary colonel. After the Second World War, Abrams served as the director of tactics at the Armored School at Fort Knox. In 1946, he was made a permanent captain, and two years later, a permanent major. In 1949, he graduated from the Command and General Staff College. Afterward, he commanded the 63d Tank Battalion, 1st Infantry Division, United States Army, Europe, until 1951. Abrams then served as the commander of the 2d Armored Cavalry, United States Army, Europe. 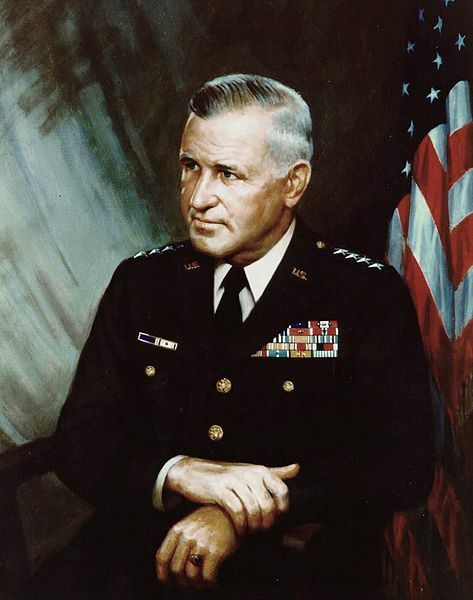 He graduated from the Army War College in 1953; then he served successively as chief of staff of the I, X, and IX Corps, United States Forces, Far East, Korea, from 1953 to 1954. In 1956, he was made a temporary brigadier general, and was the deputy assistant chief of staff for reserve components until 1959. Abrams next served as the assistant division commander of the 3d Armored Division, from 1960 to 1962. In 1960, he was promoted to temporary major general; he was made a permanent colonel is 1961. Abrams commanded the 3d Armored Division until 1962, before serving as assistant chief of staff, Office of the Deputy Chief of Staff for Operations from 1962 to 1963. In 1963, Abrams was promoted to permanent brigadier general and temporary lieutenant general. He then served as acting vice chief of staff and vice chief of staff of the Army from 1964 to 1967. In 1964, Abrams was made a temporary general and permanent major general a year later. He served first as deputy commander, then as the commander, of the United States Military Assistance Command, Vietnam, from 1967 to 1972. He was the Army Chief of Staff from 12 October 1972 to 4 September 1974. As Chief of Staff, Abrams led the Army in the final stages of the Vietnam War, supervised force reductions, and oversaw organizational restructuring. He died while in office, on 4 September 1974, in Washington, D.C.